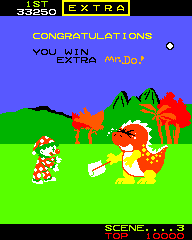 This is a graphics hack of Mr. DO! that attempts to improve the graphics by making Mr. Do! look more like the character depicted on arcade fliers for Mr. Do!’s Castle and Wild Ride. Dinosaurs now look more like dinosaurs, and all the cut-scenes (passing 3 rounds, extra life, and free game) have been redrawn. Subtle changes have also been made to clean up the Mr. Do! logo on the title screen. When applying this patch, use the standard zipped Mr. Do! 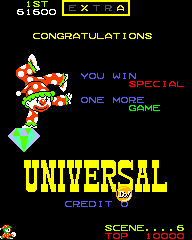 (universal) ROM set, but make sure to remove any extra .html or text files that often get inserted by ROM sites. 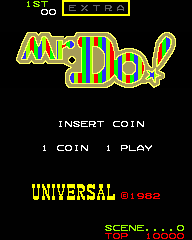 Game will run as Mr.Do (universal) in Misfit Mame.